A couple weeks ago I wrote about French toast, my ultimate cosy weekend breakfast! 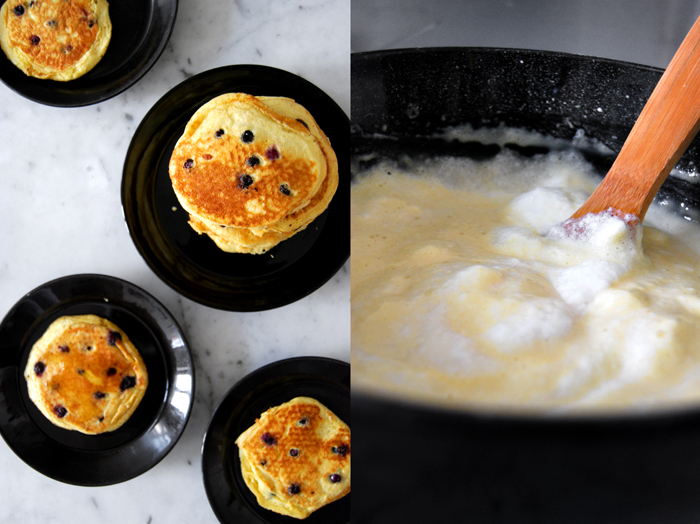 I mentioned that there is one sweet treat I enjoy as much, fluffy morning pancakes! 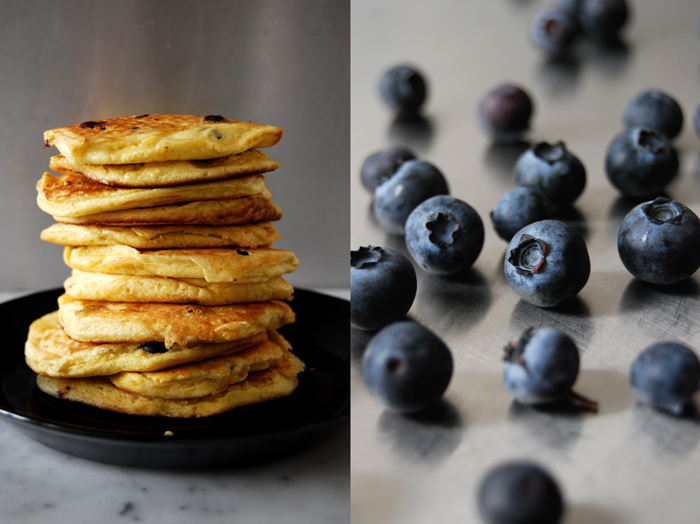 Even better, blueberry pancakes with maple syrup! The sweet berries taste divine with or without any kind of syrup but if I can choose maple is my favourite in this combination. Sometimes I replace the berries with thick slices of apple and sprinkle cinnamon sugar on top. That’s how my mother used to make them for me, or I add some chocolate spread or my blood orange marmalade, but when I saw the thick and juicy blueberries from Chile at the market my breakfast choice for this weekend was made! 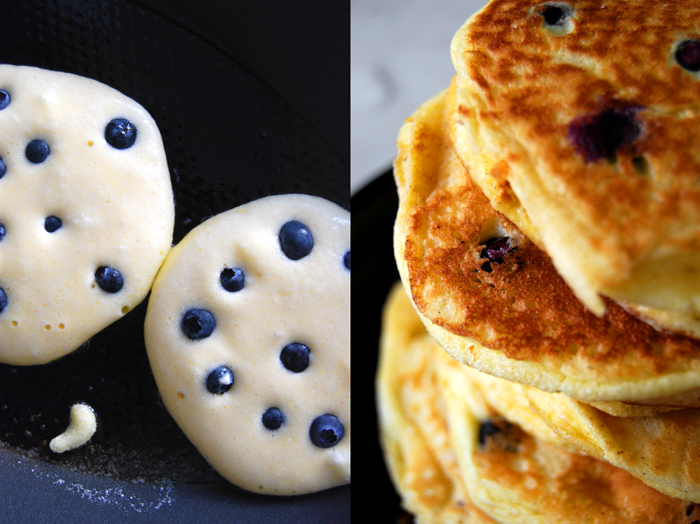 When I make pancakes, I make lots of them because I can eat lots of them. I enjoy them straight out of the pan, warm and fluffy as well as in the afternoon with a cup of tea when they are already soft and cold. For my dough, I start off with 4 organic eggs, separated, the egg whites beaten till stiff with a pinch of salt. I combine 180g / 6.5 ounces of flour (I use spelt flour type 630 but you can use any other plain flour) with 2 scant teaspoons of baking powder and 1 teaspoon of sugar. I add 200 ml of milk, the egg yolks and mix everything well before I gently fold in the egg whites. I fry the pancakes in batches, 3 at a time always adding a teaspoon of butter before I pour a ladle of my thick dough into the pan. 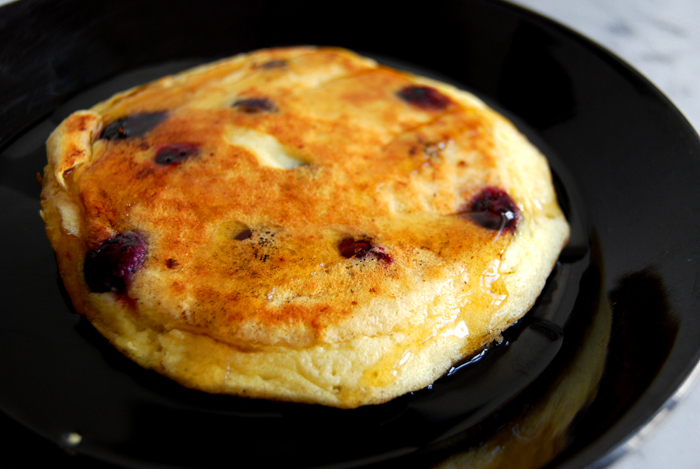 I sprinkle the soft dough with the blueberries, pushing them in a bit so that they won’t burn when I turn the pancakes. When they are golden brown on each side, I pile them up on a plate, pour the maple syrup on top and sprinkle with cinnamon. Sometimes I even let some butter melt on their golden tops, it’s the weekend after all! i made these last weekend, and they are the BEST! nice and fluffy. thanks for sharing! love your blog and your honest, beautiful yet simple posts. Those look delicious…have never made them with whipped egg whites. Have a great weekend, Meike! Thank you Marigene, the whipped egg whites make a very fluffy texture. Sometimes I make my flat pancakes (without the whipped egg whites) like French crepes, fried in a big pan and rolled up like a wrap, with a fruity filling. I like both! I wish you a wonderful and sunny weekend!